Pine Bluffs, Wyoming - Anderson Harvesting is at its first standstill of the harvest 2017 season. Farmer Lance, with his 25 bushel average/62 pound test weight crop, is all cut up and now the real question arises; where do we go from here? John's ear and his phone have been inseparable for the past few days and the decision is still up in the air. But, as Papa T said, "you go where the wheat is ripe." Western ND is looking like the best bet! So, since I'm running low on harvest action, I'm going to try something a little different. I've decided to call this little segment the "harvester's hangout". What this will be is me telling three harvester tales of yesteryear. Imagine a room full of harvesters with their scuffed up boots and ball caps in a cafe, exchanging laughs and stories with one another for hours and hours; that's the feel I'm going for. So, grab a nice cup of coffee and have a comfortable seat because that's how the best tales are received. Hardin, Montana - Things can get pretty dry in Montana in the summer. That doesn't sound like that unusual because a lot of places get dry. However, it takes on a different meaning when you're dealing with some of the desolate areas that make up the state. There aren't always the square north/south or east/west roads every mile or so like you find in some parts of the plains. If lightning strikes, and a fire starts, it's not always very easy to fight because of the very remote, and often rough terrain. Same can be true for a fire started by harvest equipment. The fields in the part of the world can be very large, I'm talking 1000+ acres. If a fire starts and blows through a field, the consequences can be devastating and extremely difficult to fight. Crews are often driven from the field for rain, but at this stop, the crews have been asked to shut down when the fire risk seems especially high, which is completely understandable. There are disastrous fires currently burning in the state. Hardin, Montana - For those of you who have been waiting for the Montana pictures, well, you're in luck. They're starting to trickle in. Montana usually seems to be a highlight for the crew and readers probably because it so unique environmentally. They don't call it "Big Sky Country" for nothing! The report from Mark and the crew up in Montana is that they're cutting in absolutely beautiful country. They've seen lots of deer and other various forms of wildlife. The harvest has been respectable too. At the first farm, they've seen yields mainly in the 40-60 range with spikes all the way up to 100 bushels per acre. Below are some photos they've sent in. 21 Jul Janel: What’s it going to be? Pierre, South Dakota – We made the big trip from Western Nebraska up to the Pierre, South Dakota area, and there is definitely a big ole drought going on. I was told that there really hasn’t been any rain at home in Nebraska since May, and South Dakota looks to be the same way. I could see the drought results as I traveled across Kansas, Nebraska and South Dakota last week. Kansas looked alright, but as soon as I was in Nebraska I could see it. And it became worse as I traveled into South Dakota. On the way up here we ran into road construction at Mission, South Dakota. There was a sign at Valentine, Nebraska that said road construction and width restriction 31 miles ahead. We asked around in Valentine; and everyone said they had seen lots of combines going north, and we could get through there. We got up to Mission, and there it was. There they were working on the main street that we travel, and our wide loads couldn’t fit through because of the cones. I wonder how many combines have just been hauled through there anyway. A local was nice enough to stop and tell us to turn around at the school, go back a mile and then head west on the gravel. Then at the dead end, go north up to Highway 18 and we would be back on the right track again to Highway 83 north. There was no detour route sign anywhere. For goodness sakes, why not? Laura Haffner and AAWH’s Sarah Moyer talk about balancing family and business during harvest. In addition to the lessons they find from the HPH crew, she focuses on her children's character development and creating impactful experiences for them on the road. Tune in to step into the field with Laura. Bayard, Nebraska - Well, courtesy of AAWH, Anderson Harvesting will be heading back south a bit to Pine Bluffs, Wyoming to continue the wheat run. Farmer Lance awaits us our arrival and Farmer Don can sit back and relax, knowing his wheat is safe and sound in the bins of the elevator. He averaged about 35 bushels per acre with test weights between 62-65 pounds. Our next fields are right in the corner of Wyoming, Colorado and Nebraska. I've always wanted to be in three places at once, and I just might get my shot. 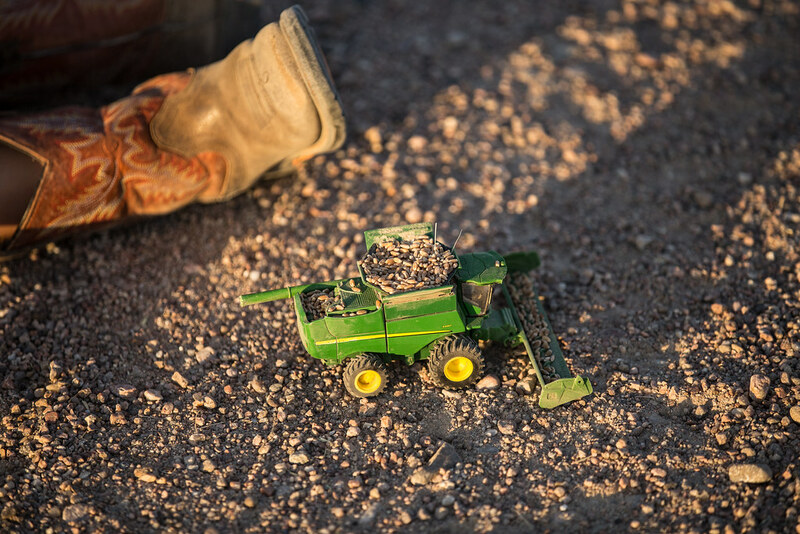 A fun fact -- Farmer Don's son brought his family out to spend some time in the field and experience harvest. The following day, his wife and kids went off to a family reunion and he stayed. Little did I know, it was his birthday! This became known to me after the fact. And I didn't even get to wish him a "happy birthday," but all he wanted to do was spend his birthday in a wheat field. That's music to a harvester's ears. Western Nebraska – This year I was in Kansas longer than expected due to the evening rain showers. We couldn’t ever work really late like we needed to and put in our time because we’d get shut down by the rain most evenings. The weather really messed with us. Thankfully, my brother Jared and Uncle Lonny were able to harvest most all of our wheat jobs in Western Nebraska before we got there. We did still get to stop there and cut for a few days, which was great. Disappointingly, the wheat I cut didn’t yield well due to mosaic disease. The wheat looked decent from the road, but the mosaic disease really got to it this year. However, Western Nebraska has some of the most beautiful sunsets with such beautiful colors. I didn’t get to cut there long enough this year to enjoy them. Morgan County, Colorado - Ryan left several days ahead of us to get started in Colorado. I had several more days of paperwork and preparation before we left home again, so I was relieved to finally have it all done and hit the road late Friday morning. As soon as I hit top speed, we experienced what I would call a "major" vibration. I exited on the next road. Nothing was visually off, so I circled around and tried again... same thing. The kids thought is was hilarious and great fun. They were laughing and making the "aaaahhhhh-ahhhh-ahhhhhh" noise along with all the vibrating. I could feel my frustration rising. All the while, I said prayers of thankfulness that this happened only a couple miles from home. A few back and forth calls with Ryan, a few calls to local mechanics to see who could get me in last minute, a couple shakes at Wendy's to pass time with the kids, several laps around Wal-Mart and visits to the pet department to watch the fish, two plus hours later we were ready to roll again. Thankfully it seems that something had just gotten out of balance, and it was nothing more serious! Bridgeport, Nebraska - Just as I was letting off the clutch at a stoplight in town, a motorcycle revved the ever living out of his motor and sped by me. I about had a heart attack -- hearing noises like that, all I could think was that I blew something somewhere on my truck. I mean, I am hauling 64 pound wheat, so anything is possible. It is pretty rare to have two stops on the harvest run that are a mere 27.5 miles away from each other. Obvious reasons being that they are both likely ready at the same time; and as we all know, the wheat waits for nobody. But, contrary to the norm, we moved from Gurley to Bridgeport without missing a beat. Farmer Don has some pretty spectacular wheat with test weights anywhere from 62-65 pounds, 35-40 bushel, and protein peaked at 13 for content, but is consistently between 8-10. Harvest days are coming and going and definitely running together these past 10 days or so. This time of year just works that way. It's harvest autopilot, if you will. You just do because you know you need to do, and that's all there is to it. Sheridan County, Kansas - It has been humid lately. And by humid, I mean western Kansas humid, not eastern Kansas humid. The day I was there it was downright sweltering with temperatures in the high 90s and almost no wind. Yes, it's not common out here to have little to no wind. Out in that heat is where I met Stoney, a semi-retired farmer, whom wanted to come check out the "big harvest." It has been something on his to-do list for some time, and he drove 8 hours from the east to come watch. That is REAL desire to come watch harvest on a hot July day! Of course they have harvest east of us; but the fields are often smaller, and there isn't as much wheat in his area. The scale out west is just different. Here, the field sizes are often so much bigger, and they can hold a larger number of machines, larger headers, etc. It is a little humbling to think that someone would want to visit "US." In my mind, we just do what we do, but I guess it is no different than me going to see other sectors of agriculture, like the strawberry patch earlier in the season. I think we as farmers and ranchers, of whatever type, typically have a great respect for the profession and enjoy seeing and learning what goes on in other areas different than out our own backdoor. Laura: The crew and thank you!